Let’s face it, New Yorkers love to drink. 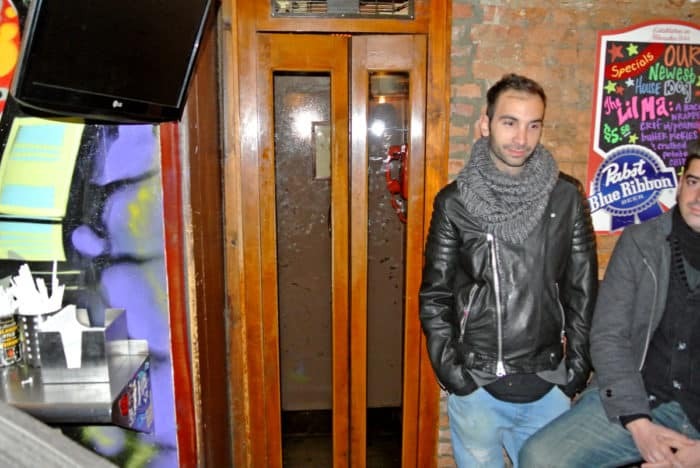 And with bars that stay open ’til 4 AM, it’s bound to get out of hand from time to time. 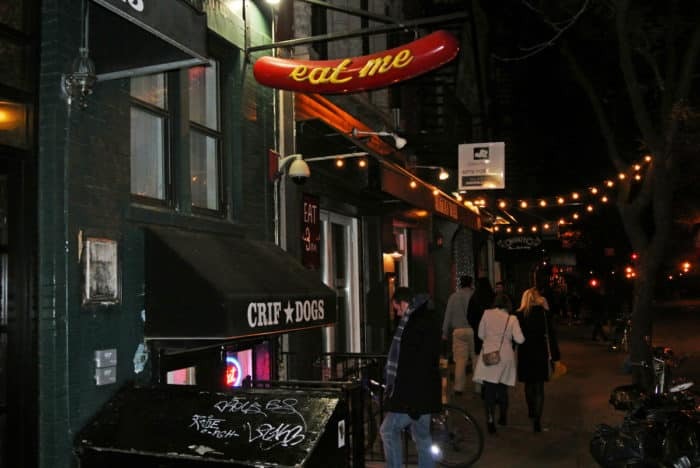 I know that I, for one, love to drunk eat after a big night out and in my opinion there’s no better place in the East Village to do it than at Crif Dogs. On St. Marks, between 1st and A you’ll have no trouble spotting it. Just look for the gigantic red wienie reading “Eat Me” protruding out into the street then make your way down the concrete half stairway into the subterranean drunk-eats mecca. 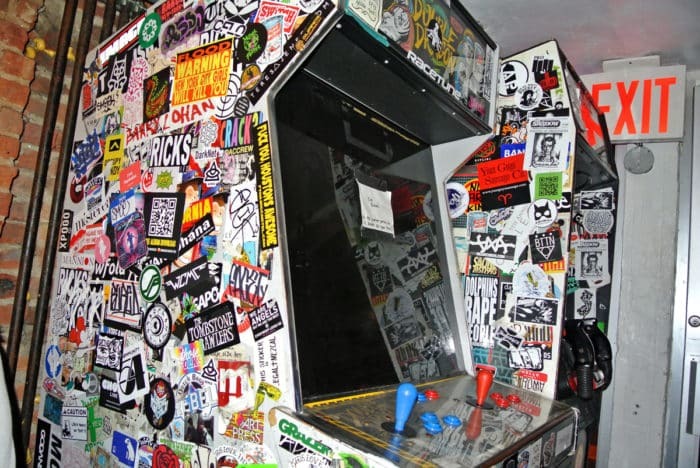 The place has a real air of East Village authenticity with its low ceilings, brick walls, beat up videos games, and excessively sticker-covered walls. You’ll notice that there are two types of people in the there. 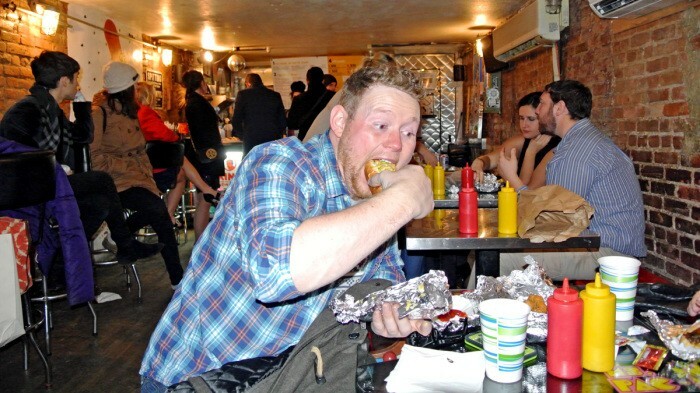 There’s the sloppy drunkards (like us) stuffing their faces with crazy-looking hot dogs. And then there’s the well-dressed yuppies idling around curiously placed telephone booth inside. 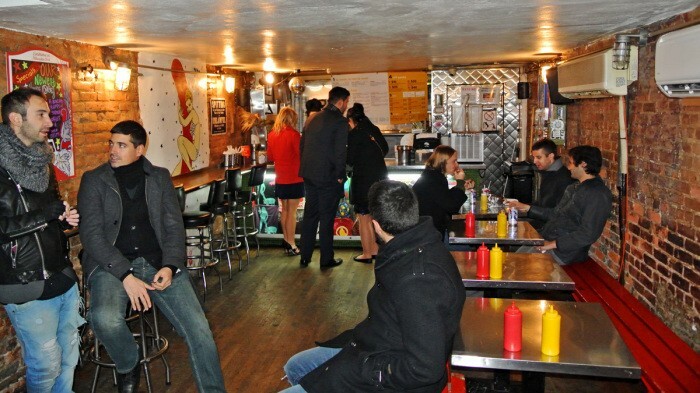 Inside this super low-key late-night wiener vendor there’s also a hidden speakeasy cocktail bar called PDT (Please Don’t Tell) that’s only accessible through a secret passageway inside the phone booth. I’ve been before and they serve really fancy experimental cocktails and specially-made, famous-chef-created hot dogs inside. And it’s always kick to take out-of-towners there solely for the excitingly unique experience of entering a bar though such a convert passageway. But, I’m always equally as happy to just enjoy the more casual Crif Dog experience and crush some of their crazy deep-fried dogs in a drunken haze. 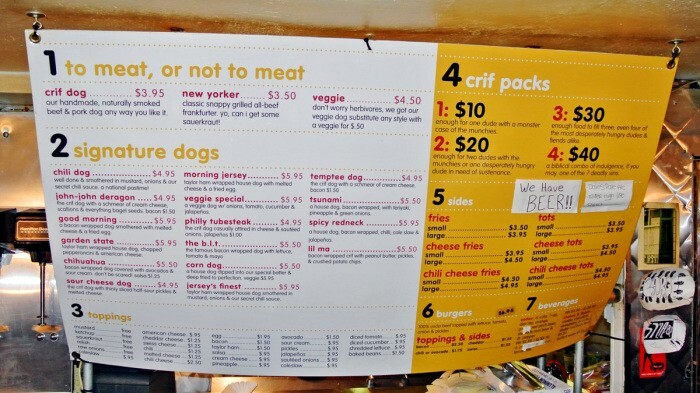 By this point, I’ve been to Crif Dogs enough times to have nearly eaten my way through the entire menu. Every one of their bacon-wrapped and deep friend hot dog creations are delicious, but I still have my favorites. Take for instance the Spicy Redneck, topped with chili, cole slaw, and jalapeños, which I love, but happened to not eat on this visit. Or check out the Jon-Jon Deragon which includes cream cheese, scallions, and everything bagel seeds (add hot sauce to that one!). They’re all delicious, it’s hard to go wrong. But on this particular late-night binge, we went for a Tsunami which takes a house dog, wraps it in bacon and tops it with teriyaki, pineapple, and green onion. I know this sounds like a totally bizarre combination to load onto a hot dog, but you’ve gotta believe me – it just works. 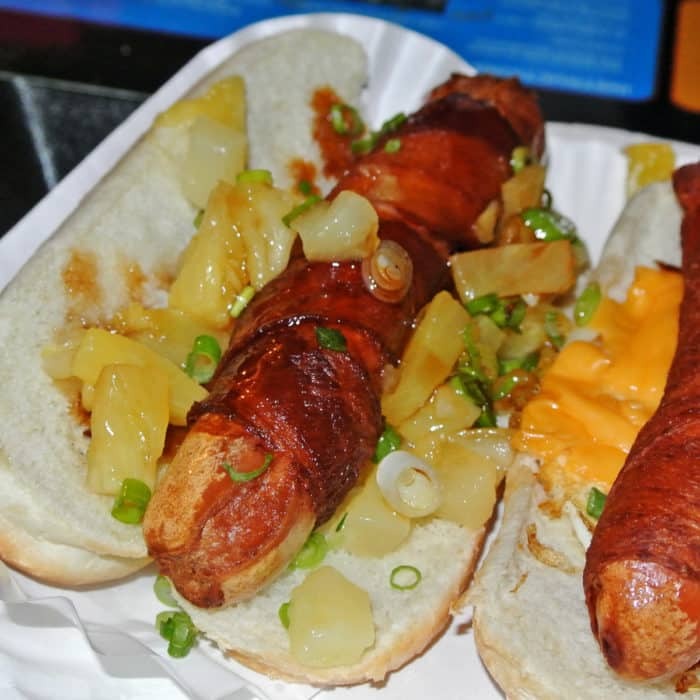 This Polynesian inspired dog doesn’t sound like something I would instantly love, but it’s combination of sweet and savory has indeed made it become one of my favorites. We followed that dog up with a Morning Jersey which replaced the usual bacon wrapping with a traditional New Jersey breakfast meat called Taylor Ham and served it along with melted American cheese and a fried egg. For those unfamiliar with my beloved Taylor Ham, think more Canadian Bacon than bacon bacon. It’s similar, but different. 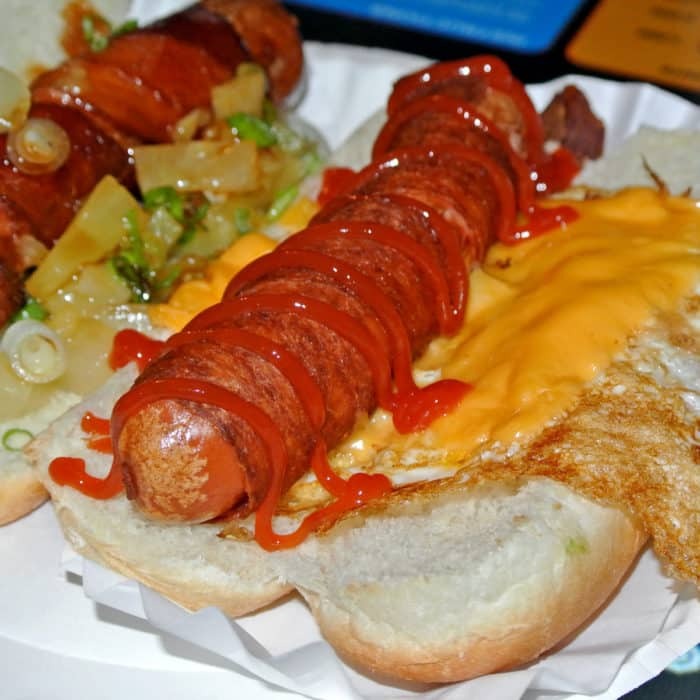 And this hot dog creation was a total breakfast-styled masterpiece – twisted and perfected for the drunk munchie-filled masses. We added bit of ketchup to this one because it just seemed to make sense with the array of breakfasty ingredients. And what Crif Dog visit would be complete without an order of Chili Cheese Fries? 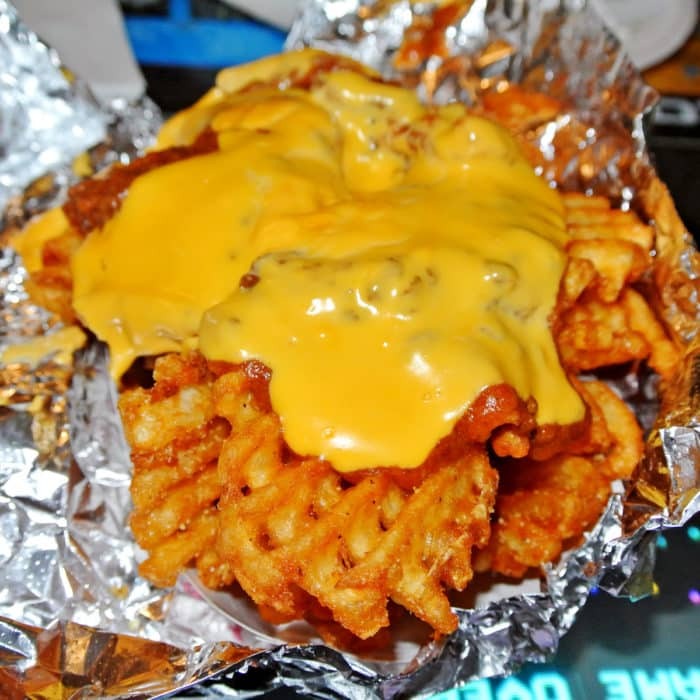 Their waffle fries are executed really well and came absolutely smothered in all of the good stuff. There were no surprises here. Just awesomely crispy waffle fries with deliciously meaty chili and glowing orange nacho cheese poured over top. Perfect. 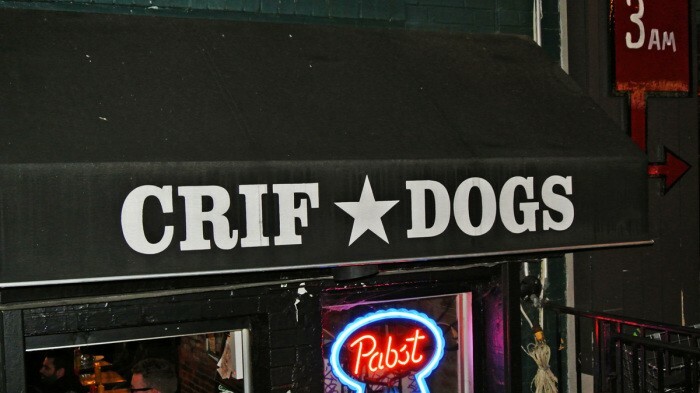 At this point, it should be no surprise to you why Crif Dog draws such a large and ravenous late-night crowd. It’s cheap, it’s flavorful, and it’s VERY satisfying. Honestly, I think it’s the perfect drunk food. That must be why I find myself there at 3 AM so frequently. 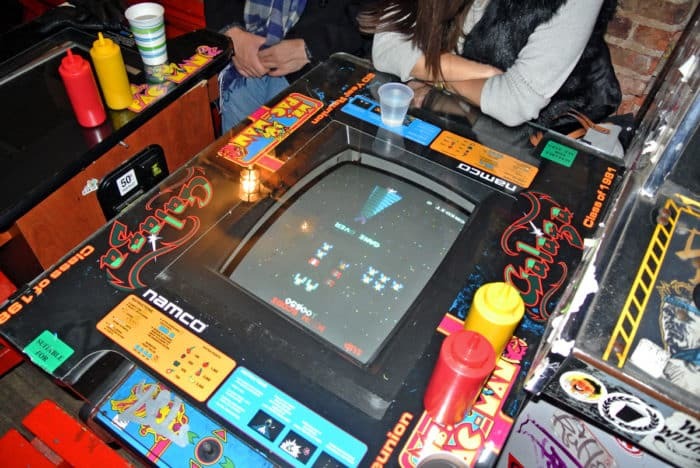 Where do you go to crush the drunk munchies late at night in NYC? Let me know in the comments below.